Home » Giant Thoughts » The Eighth Wonders » Where do forests come from? Whenever I’m out in the forest, I can’t help but think about how it all got started. Even though the redwoods may seem timeless and unchanging, they almost always began in turmoil. These periods of rapid change are known as disturbances, and are among the most important of nature’s processes. Disturbances are the events that create and shape forests. They may be as small as a single limb falling from a tree or as large as a hurricane. They may be as acute as a single storm or as chronic as the appetites of beetles and bears. Over the millennia, species have evolved with the type and timing of disturbances particular to their areas; for our forests the type of disturbance ranges widely from north to south, east to west, and high to low. 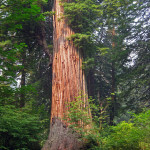 Fire, flooding, windstorms, landslides, animals, and fungi have all played a role in creating a tree as grand and adaptable as our beloved redwood. Burned tree in Redwood National Park. Disturbances are among the most vital processes in the forest, yet they are also the most misunderstood. Fires, floods, and windstorms are lamented as destruction, and enormous amounts of time, effort, and money have been spent attempting to prevent or control them. This philosophy, well-meaning as it is, fails to appreciate the true nature of disturbances, and the promise they bring for the forest. At the smallest scale, disturbances create room for trees to grow larger, reducing competition for space, light, water, and nutrients. At larger scales, these events remove the canopy and the shade it creates, change the soil (exposing mineral soil after disturbances like fire or windstorms that topple trees, or depositing silt after floods), and set the stage for a new forest to begin. Without disturbance, forests would stagnate and stall: trees unable to grow, seeds unable to germinate, animals dependent on open ground for hunting, breeding, or nesting unable to find the habitat they need. Of course, not all disturbances are equal, and the diversity we see across the forest comes in large part from the different ways that disturbances play out across the landscape. In higher, drier areas (on ridgetops and in eastern parts of the forest), disturbances such as fire tend to occur more frequently but with lower severity, killing smaller trees in the understory, and allowing their neighbors to grow larger with less competition. The opposite is generally true lower on the landscape, in river bottoms and coastal areas, where catastrophic events like major floods often wipe out whole stands, and deposit the rich silt upon which a new forest can grow. Today, of course, the most common disturbance is logging. Logging can of course be terribly destructive, but in an era in which natural disturbances have been largely eliminated, harvesting trees has the potential to recreate the processes with which these great trees and all that grows beneath them evolved. It is impossible to imagine a forest without disturbance; the destruction we see is but an instant in the lives of trees, and the new life that disturbances bring can often be borne no other way. Next time you’re out in the woods, look around at the size and structure of the trees you see, keep an eye out for stumps and new growth, charring and root mounds, and try to figure out how your forest got its start. Want to learn more? Take a look at some of the redwood research we’ve funded about how coast redwoods respond to disturbance events!